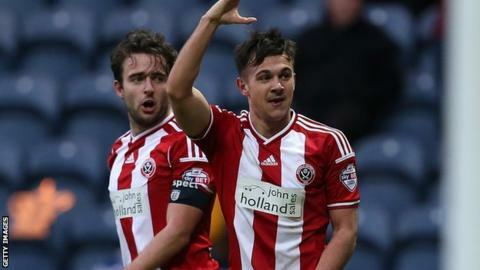 Sheffield United boss Nigel Clough has confirmed that Italy Under-20 forward Diego De Girolamo is to leave the club in the summer. Contract talks with the 19-year-old broke down at the end of last month. He spent time on loan at League Two York City earlier this season, scoring four goals in eight appearances. "His time here will come to an end when his contract ends. He's rejected his contract offer and the chance to stay here," Clough told BBC Radio Sheffield. "We felt we had offered him a good deal but I think he feels he will get better opportunities elsewhere." The Blades will be due compensation from De Girolamo's next club because they brought him through their academy and he is under 24. The Chesterfield-born teenager scored his first goal for the club in January's 1-1 FA Cup draw with Preston but has not been included in the squad for the last three games. Clough denied that the player's contract situation was the reason he had not been involved. "We've got Matt Done who has come in and Marc McNulty is a better player than Diego and he can't get on at the moment," he said.